There is a very interesting planetary alignment that will take place in two days Dec 3, 2012. Some astrologists and astronomers believe that it is an extremely rare, precise & significant planetary positioning over the Pyramids at Giza. Although there seems to be some differences on the occurrence rarity, it is none the less quite potent and timely. The December 3rd alignment is an important 'code, step as we enter the countdown to the 12-12-12 Ascension. 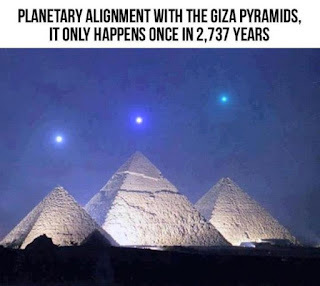 Much is happening and December 3rd alignment absolutely provides downloads onto the planet that not only effect Giza, but the entire planet, as Giza feeds into ALL vortexial portals,including Easter Island and Arkansas.